Ooopsie, looks like I was in the wrong place, and I've been downgraded to a supporting role. I have been struggling with the gear change mechanism over the past few months. What should have been a set of simple parts to make turned out to be anything but; let alone trying to get the mechanism to actually work. For scale the OD is just over 1" and the involute tooth form is for a 25 tooth equivalent spur gear, as per Tregold's approximation. It should be possible to machine these on the CNC mill, roughing with a 1.5mm ballnose cutter and a final pass with a 1/32" ballnose cutter to clean out the small end roots. 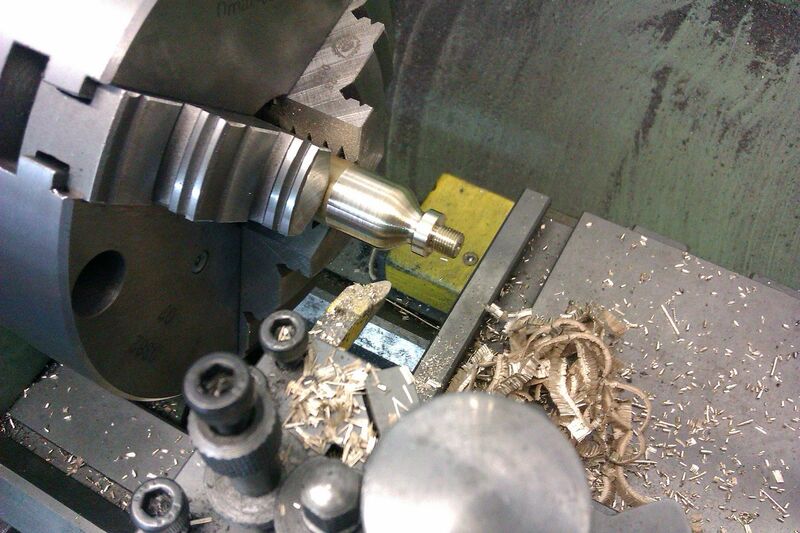 Some quick CAM programming shows it should take 22 hours to machine at the maximum speed of my CNC mill, ie, 5000rpm. So I'm considering buying a high speed spindle to bolt along side. It means I lose the ability to use tool tables, but I can cope with that for a setup like this where there are only two tools. I've also added a 3D PDF of the assembly. By clicking on the PDF you should be able to zoom, pan and rotate the gears. A timely post Andrew as I soon have a set to cut for my Tidman engine governor at 2:1 and about 2.5" dia for the larger wheel. I'll be following along even though I will have to opt for parallel depth method. Nicely drawn too, did you cut-extrude one gear and then place that in a circular pattern? I looked at using the parallel depth method for the design of these gears some while ago, but it all got very messy and either gave fractional DPs, or gears that weren't going to fit without a major re-design. By playing with the CAM software I've got the machining time down a bit, but there is really no alternative to having a high speed spindle. When I made my 6DP bevel gears in cast iron I was running the 4mm cutter at 4000rpm, so for the small cutters I need here running at 5000rpm is definitely pedestrian. Thanks Andrew, I'll have a better study of the drawing later. I suppose you could print them out and get some lost wax brass castings done. My diff gears are cast but they do run a lot slower than a governor, suppose it depends on how much belt work you are ever liekly to do. MAybe even get them printed in metal? A strange thing happened today; I actually made some parts without having to scrap them and do it again properly. Just the governor bevel gears to go now, and that will be all the gears for the engines finished. After a bit of faffing about with a couple of trial nuts I got the screwcutting down to less than 3 minutes per nut at a conservative 260rpm. Look good Andrew, did you cut the thread in one pass or several? I see you have an article on the Britan in the latest MEW, will have a read of that in teh week. Not flying this weekend or were you fogged in? It has been very clear hear both days. Jason: The threads were cut in several passes. Four passes at 20 thou total cut each, plus a pass and spring pass at 15 thou total cut. That got me to the arbitrary reading of 105 on the cross slide dial. A quick check with the external 'gauge' and a final cut at a reading of 102, plus one or two spring passes at the same setting. Quicker to do than write about. That's the beauty of a high speed threading unit, no faffing about with thread dial indicators, and an automatic trip at the end so you can run the tool to within a thou or so of the shoulder. The spring passes produced rather odd swarf. For most cuts the brass comes off as a fine spray, as one would expect. However, for the spring passes it comes off as a thin crinkly ribbon. Never seen brass behave like that before. If anyone is curious I can post a picture. No flying this weekend, but I'm tug pilot next Saturday. Both weekend days were a bit misty and Sunday went completely pear-shaped. It started a bit misty but then got a lot worse. It fooled the gliding club as on the webcam mid-morning the gliders and winch were out and ready, but you couldn't see more than a 100 yards. I finally got around to writing the article on the Britan, sent it off, and got an email back from Neil saying it had been expedited into the forthcoming issue. Jason: That's the swarf type! I've only ever seen it during screwcutting with shallow depths of cut. Having just looked at some of the swarf under a magnifying glass it is of a V form. I screwcut by plunging straight in so the tool is cutting on both flanks. Thus the swarf seems to mirror the shape of the tool. It is as if each small piece of swarf cannot escape and so attaches to the next piece to produce a long curl. Certainly the crinkly swarf is not thrown off in the energetic shower that brass normally produces. The wing valves are made from glass filled PTFE. It's the first time I've used this material. It's waaaay nicer than virgin PTFE, which is 'orrible stuff for holding tolerances. With the glass filled PTFE it is easy to hold a few tenths. Next job is to hacksaw the ram blanks to length and finish the machining. The plan this time is to not let the hacksaw slip and damage the surface. Hi Andrew, I hope the hacksaw didn't slip! Your water pump looks different to mine. I'm using ball valves as per Filby drgs. Terry: Fortunately the hacksaw didn't slip second time around! Three pumps? That's because I'm making one for a friend who is building the same engine. Apart from the main casting the only parts in the picture I didn't make are the M4 nuts, although I did buy a length of hex steel just in case! It will probably get used when I make the nuts/bolts for the wheel hubs. Speaking of which it's a nice day for a change so I'm now off to angle grind and weld parts for the wheels. Bad Behavior has blocked 12944 access attempts in the last 7 days.